Megan Racing Coil-over System for R60 MINI Countryman with adjustable camber plates. Featuring 32 levels of damper force adjustment, separate spring perch height and shock length adjustment allowing you to retain full suspension stroke and to fine tune your suspension characteristics. Compression and rebound settings are easily adjusted through a single damper adjustment knob which is built-in at the top of the damper mount for easy access. Adjustments are simple to tune according to your style of driving and desired comfort level whether you are a professional certified mechanic or an automotive enthusiast with amateur mechanical skills. 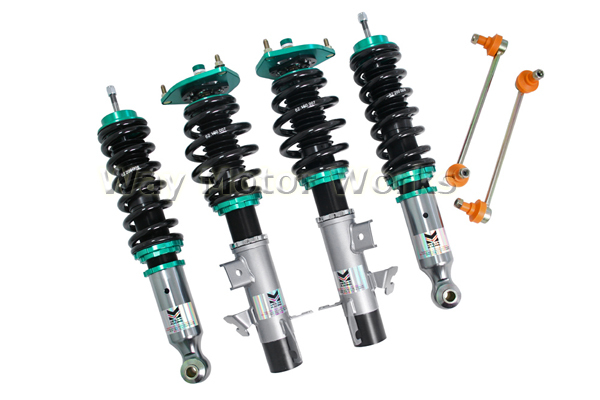 All of our dampers are capable of handling a +2kg/mm or -2kg/mm change in spring rates to further tune your suspension to your desired handling characteristics. Installed these on my 2012 Mini Countryman S! Huge improvement over stock! Brought the ride height down to where I wanted it to be and improved the quality of the ride as well.